Our favorite and least favorite moments of the series, YOUR favorite and least favorite moments, the history of the podcast, how the show has impacted us, some fun moments from the podcast, and one last crackpot theory as we relive the best moments of the show in this hour-long cryfest of “Farewell, Once Upon a Time” podcast! Snow and Charming’s story of how they met – the original one not the one changed by time travel. Emma believing, fighting with Regina and kissing Henry to break the curse. Charming’s line about Thanksgiving because it shows how everyone is connected and acknowledges that yes it is a little crazy how we are all connected. We loved the Thanksgiving line because it’s so spot on; it’s fortunate that they don’t have Thanksgiving because it will be chaotic. If I had to go with one, probably 2X14, Manhattan. To me that episode was borderline flawless. No doubt, killing off Neal. Especially when I read it wasn’t because the actor wanted out of the show, it was just a boneheaded decision made by the show-runners. That said, 3×11 “Going Home” have some of the best moments of the series. Overall moment; Season 3, Episode 11 – Going Home (the Season 3 mid-season finale): As Pan’s Curse descends upon Storybrooke, Emma and Henry bid a tearful farewell to their family and friends at the town line as they leave Storybrooke for New York. Regina reveals they will lose their memories of Storybrooke but gifts them new memories of Emma raising Henry. Two and a half seasons in and the cast had built up such strong relationships, everything about this scene resonated. If Once had ended there and then, I would have been satisfied. I’m glad it didn’t as there was much more to come but honestly, that Neverland arc was brilliant and this moment encapsulated the character relationships perfectly. For all those reasons, season 3 finale will also go down as one of our favorite moments of the series. That would’ve been a really good series finale which, in a way, it kind of was. So what is the show’s legacy? 5) If you plan to do a reboot — choose wisely — the timelines alone would make one head’s spin! Speaking of Mark Isham, he did released the series finale’s score, which everyone can listen to in his website. On the other hand, it was amazing how some of the series’ fans continued to tune in because they want to keep tuning to our podcast, and for that we are grateful. For a time, Alie Ward even recorded several recaps of the series; the show even had their own Once Upon a Time podcast for a while. Mine is probably the Belle & Rumple wedding, and the dance in the episode after. The best! Another top favorite moment is probably Belle and Rumplestiltskin’s wedding, as well as the fact that Rumple and Belle got to grow old together. Thanks for everything you do! I’m truly going to miss this podcast, but everything must come to an end. So my favorite moment for the final season is from the episode Beauty when RumBelle get to somewhat grow old together. My favorite moment overall is from season 6 episode Heartless when the evil queen puts the sleeping spell on Charming and Snow. That was great writing! Another of our favorite moment from this episode was when they talked about building a house and Rumple throwing the Dark One dagger to build their house from scratch, without magic. The musical episode, “The Song in Your Heart” (6×20). This episode completely encompasses all that is beautiful and magical about the series, and I was so thrilled they were able to give us that feeling again so late in the game. Snow and Charming at their best, the Evil Queen at her worst, and the wedding. Emma’s incredible transformation from a lonely young woman into the Savior, surrounded by people she had come to love and who loved her on her wedding day was a perfect end to her story. Not to mention, the music was SO MUCH FUN. While season 6 was a really rough season, the musical episode is definitely one of the show’s best episodes; it was a masterpiece, the music most especially. They definitely hired the musical nerds just for musical episode. Prince Charming’s entrance, for one, is surely our favorite moments of the episode. Rumple and Belle’s love story as told in the flashbacks throughout “Skin Deep” (1×12). This will forever be my favorite episode of the show. Robert Carlyle and Emilie de Ravin (as well as Jane Espenson) gave these two characters so much depth and so many beautiful and complex layers that they became the most intriguing and dynamic relationship the show ever explored to me. As for the show’s top love story, Rumple and Belle’s is also one of our favorite stories of the series, as well as the time when Belle forced Rumplestiltskin over the townline with the Dark One dagger. My number one scene of all of once upon a time is the only scene which caused me to cry uncontrollably.. This is when Belle forced Rumple over the town line with the dagger. Seeing Belle finally give up on Rumple is heart wrenching, but the nail in the coffin was when he falls to his knees on the other side of the town line, unable to walk, or see Belle again. Thank you so much for this amazing podcast! I started listening since season 4 and it has made the show so much more enjoyable. I’ve been meaning to send in feed back since then but I haven’t. Erin mentioned that when watching the series finale she thought “Jeremy won’t like that.” I realized I actually do the same thing when I’m watching! Wouldn’t watch the show without this podcast, maybe. Love Y’all. This is such an unpopular opinion, but my favorite scene of all time in Once Upon A Time was actually in Season Five. It was in the episode “Dreamcatcher” (5×05) when Emma held the dreamcatcher to her chest and started crying because it reminded her of Neal. Thanks guys for the podcast! A lot of fan favorites also included some of Regina’s scenes with several other characters, including Snow White and Emma. It was nice to see how Snow White and Regina’s relationship developed from the beginning ’til the end of the series. A) Creative back stories: I loved how they explained the genie of the lamp becoming the magic mirror and in Red-Handed when so many stories collided (Peter and the Wolf, Three Little Pigs, Red Riding Hood, etc.) and we discover that Red is actually the Wolf. B) Sacrafice: Some of my favorite moments are when characters make a sacrifice either for one specific person or for the greater good. In 2×22 I love how Regina is willing to sacrifice herself to deal with the fail safe. Emma coming back to join with her to stop it makes the moment even better. Another great example is 3×11 Going Home when Regina gives up Henry in order to stop Pan’s curse and she gives Emma and Henry happy memories. C) Snow & Regina; In the episode Unforgiven when Snow and Regina stand under the embrella and Snow risks sharing her secret with Regina. This is an example of many great moments between them later in the series which show the development of their characters. D) Villain arc ending: I think Ingrid’s end was the best. Her ending was both sad and happy, call it bitter sweet. At the end she got what she wanted. Plus the music was fantastic. “We are both” is good advice. Each of us is much too complex to be perfectly self-consistent. Cora trying to steal Emma’s heart and it not working. The greatest thing about OUAT for me will always be their treatment of the villains. Giving them backstories and personality and showing that evil isn’t born, it’s made. I loved the ups and downs this show had when it comes to showing how it isn’t always easy trying to do the right thing and that sometimes even bad people had good intentions or vice versa. Belle falls into Rumple’s arms while trying to pull down the drapes… Rumple overcoming his fears to kill his father (and himself) to save the town. WickedRegal also wrote a heartfelt love letter to the forum family, which she shared before the series finale episode. Tonight is the big finish guys…we did it…we made it through to the end, LOL!!! We may have lost some members along the way but we’ll still love them no matter what, and whoever is reading this, whether it’s returning forum members or guests to our forums—which I have no idea how long will stay up LoL—-just know that we’re family through and through! It’s been seven years…we’ve all been a part of each other’s lives not just through the show but so much more…it’s truly been the ride of a lifetime! I don’t know what will become of our forums after the last chapter airs tonight, but you guys will always be the best part about this experience. 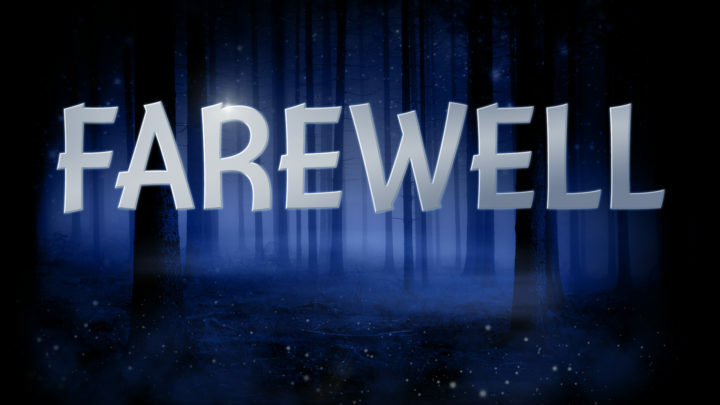 The friendships, the laughs, crazy theories, predictions, the fun, the jokes, and yes even the numerous fights that @rumplesgirl & @matthewpaul had to break up….we’ve enjoyed OUAT when it was at it’s best, and survived it when it was starting to become at it’s worst….the journey of the show may end tonight, but I’m happy that the bonds we formed over the last seven years will last forever! Thank you for seven magical years forum family, and thank you for forever lasting friendships! As for the forum’s least favorite moments, a lot expressed that Neal’s death, as well as season 7’s overall story are two things the show fell short with. That being said, season 7’s Alice is definitely the one that they did well for the final season of the series. For us at ONCEPodcast, our life has also changed a lot since the show started. Just like the series and its characters, a lot of us changed status from single to married, to having a baby. I started watching Once in the summer between season 1 and 2. I binge watched the first season and if memory serves discovered the podcast while eagerly awaiting season 2. Listening to podcasts was a fairly new experience for me at that time – there were only a couple others that I had picked up. This was the first podcast I ever sent feedback to and i was surprised and delighted when my feedback was actually included in the show. I really never expected it would be. Having my feedback included alongside other listeners made the podcast feel more like a community I was participating in than entertainment I was merely consuming. Participating in the podcast made watching the show more enjoyable and helped me stay engaged during some of the rough patches across the series. There was something warm and comforting in listening to the podcast, it felt like catching up with old friends even though most of us have never met. Thank you all for many wonderful years of podcasting. A few of us also had ONCEPodcast as our first client, or moved closer to work throughout the course of the show. As the show pointed out early on, stories help us process real life. A lot of the messages have really been encouraging for most of us, even though some of it are questionable at times. Long time listener but first time writer here. I started watching Once the day it premiered, when I was ten years old. It was the first serialized show made for adults I had ever watched on a week-to-week basis, and it completely blew me away. I’m seventeen now, getting ready to graduate high school, and Once has been with me through it all. I’ve been listening to your podcast since season 4, but I’ve since gone back and listened to every episode from the beginning. I wanted to thank you all for devoting so much time and thought into a show that was not always easy to love, and say that all your effort was much appreciated. You guys have made the show immensely more enjoyable during these last few rocky seasons. Once has certainly had its ups and downs, but I’m forever grateful for all of the joy and hope its brought me throughout these last seven years. Some of us also went from student to working girls, moved to another city, as well as changed careers. Through the years, many of us met a lot of amazing new friends who made watching Once Upon a Time rather more enjoyable and bearable. One thing I’ll always be grateful that Once gave me is that it gave me something to talk about with one of my aunts. I wasn’t particularly close with this aunt but then we discovered that we both liked Once Upon a Time. It gave us something to talk about at family gatherings and it gave me someone to text about the show. She used to live near my work and we went out to lunch a few times. Without Once I’m not sure we would have developed the relationship we did. One of the show’s greatest impact is how it bonded us with people, not just our relatives, but also new friends that became a part of our everyday life. Furthermore, some of us found comfort and solace in various groups like the forums, as well as The Ugly Ducklings. Most of us also grew up with the show literally and figuratively, and learned to balance everything out. Hi there! I thought I would chime in on how OUAT has affected my life in the past seven years. Once Upon a Time began when I was 11. Fun fact, Jared Gilmore is two weeks older than me, so it felt at times like I was growing up with Henry. On the episode when Henry had his first date with Violet, I had just recently gone on my first date!…. I stopped watching the show around season six, but I came back for the musical episode as well as the finale. There were parts of the finale that didn’t make much sense to me, but I also cried intensely when Snow and Charming, and Emma made their entrances. Like you guys, I was fairly critical about the show in the later seasons, but I think all it took was taking those characters away for me to realize how much I missed them (cue Felix’s line about how things we haven’t thought about in years still have the ability to make us cry). And I guess that means they did something really, really right. Anyways, thank you for your fantastic rant fests <3 I had always hoped I could run into one of you in Steveston during filming so I could thank you in person for all the laughs, realizations and squid ink. Farewell for now, Dearies! This show for the past seven years has changed me tremendously. In the times I felt I was being pulled in many different directions to be something for everyone else but myself to when I was around people who could only see me for my past and not for who I am today. This show helped me find solace and healing in those areas of inadequacy, hurt, pain and loneliness and it also sparked a new level of creativity for me, and as for the podcast, I found it when I felt alone in my love for Once Upon a Time and I found others who were obsessed with the show as much as I was and still am. Thank you all, Daniel, Jeremy, Erin, Jacquelyn, Hunter, everyone else who has worked on the podcast and all those who work so hard on the website and forums. This has been an amazing ride. It’s sad that it had to end but all good things must come to a close, but I’m sure the story isn’t ending. There will be more and the stories that have been told and these characters will live on forever. So until next time, this isn’t an ending. I hate endings because a story’s done and everyone here, well, their story it’s far from over. I refuse to believe there won’t be more adventures, more love, more family, and yes, there will be more loss because that’s just apart of life. And in the end we can get past it all with hope. Love you all and God bless. I really love the ONCE podcast and the incredible work that Daniel and all the co-hosts (past and present) have brought to the show over the years. I am more sad about the impending end of the podcast than I am of the series ending. Having listened over the years and enjoyed getting to know the hosts through discussions and banter, I have often wondered how everyone came together to form the podcast team? With Daniel and Jeremy having watched LOST together, ONCEPodcast began before starting a LOST rewatch podcast. With Dan Flynn and Jenny Lewis as the third and fourth hosts, ONCEPodcast was launched a few episodes after the show started. After hearing some fan podcasts that talked about the show with theories because they are spoiled, ONCEPodcast became the non-spoiled podcast version of the show, with theories shared with each other and a separate section for the spoilers alone was also lunched, where Hunter and Jacquelyn came in, along with MatthewPaul to moderate the forum with Jacquelyn. John Bukenas, on the other hand, came in at the time Once Upon a Time in Wonderland aired; his editing skills made everything so much easier. Meanwhile, we found Jhack through Twitter and her thorough show notes writing abilities helped publish the episode as soon as the podcast aired. And, because of Erin’s vast knowledge of Alice in Wonderland, she became the co-host for our Once Upon a Time in Wonderland podcast, and eventually one of the co-hosts for ONCEPodcast. Heather Ordover of CraftLit.com, meanwhile, joined us for one season, co-hosting with Jacquelyn, Daniel and Jeremy to discuss season 5a. Through the history of the podcast, we had some people helping us through as well, including Keb, who manages the timeline of the show. One of the well-executed episodes of the series was the musical episode, and will go down as one of our most favorite moments of Once Upon a Time; it would also make for a great series finale. Furthermore, season 3a’s finale as well as the entire story arc was well done. Aside from the episodes itself, another favorite moments are some of Snow White and Regina’s scenes, including the Evil Queen making Snow eat the apple, as well as when Snow asked Regina to crush her heart. It was really a well done moment; we really loved their development as characters. Another favorite character moments was Neal and Rumple’s 3-minute conversation in the episode, Manhattan. Also in the episode, we liked when Emma confronted Neal about knowing who she was and asking him about him leaving her. It was good acting and good writing, too! As for storylines, we really liked Graham and Merida’s story, as well as Snow White and Prince Charming’s line, “I will find you. I will always find you.” That being said, one of our least favorite moments was Emma saying, “I will find you, Hook. I will always find you.” Way to steal your parent’s line, Emma. Another least favorite moments include a lot of filler episodes, as well as discovering that the curse was not created by Hades. Also, in our list of least favorite moments include the Dark One arc, and all the time travel stuff. Other than the squid ink and all it represents, as well as the lack of continuity, almost everything about the Underworld arc such as the handling of Hook, Neal, Milah, and the end of the Dark Ones was definitely a low point. While Greg Germann did a phenomenal job as Hades, the magical mcguffin saving the day and the ending of the Dark One arc including Robin Hood’s death sends a negative message. On the other hand, one of our favorite moments from season 5a was Emma and Neal’s meeting in the Underworld. That showcased how powerful their story was, despite how they treated Neal/Baelfire’s character. One of the things that bugged us throughout the seasons is the many “merely misunderstood” villains. There are very few times that the show surprised us, but one time that genuinely shocked us was the reveal that Cruella De Vil was straight up crazy and a psychopath; she was born evil. In addition, the many unanswered plot points are included in our least favorite moments of the show. The show’s spinoff, Once Upon a Time in Wonderland, is also one of our favorites. The many memorable lines, and the Jabberwocky are some of our favorites from the spinoff. It was just disappointing that they never got to incorporate her into the mother show. Another favorite character is Cora, who we saw both in Once Upon a Time and in Once Upon a Time in Wonderland. That whole moment when she put her staff to the ground to cast a protection spell in a section of the Enchaned Forest, as well as when she tried and failed to rip Emma’s heart in “Queen of Hearts” was definitely a favorite moment. Snow White’s reveal in the tree in the episode “Snow Falls” and seeing her story, then later on seeing her and Prince Charming’s story from a different perspective was great. Another favorite was Regina’s monologue in Neal’s apartment. Her talking about bearing the weight of the Evil Queen and how she has changed will stand out for a very long time. Regina’s entire story was the biggest success of the story; in so many ways, Once Upon a Time became all about her. Furthermore, Once Upon a Time made really good redemption stories, but Regina’s redemption arc stood out the most. Emma breaking the curse by kissing Henry on the forehead is also a top favorite. That is a classic scene, and Emma’s fight with Regina was also so good. The episodes leading up to that back in season 1 were all so good as well; it was a big character moment for Emma. As for the most tragic death, Graham’s exit breaks every ONCErs hearts. It was so well done how Regina crushed Graham’s heart, but it was such a tragic death moment. On the other hand, getting to see the final battle happened was one of our favorite moments, even though it turned a bit of a let down. Rumple’s speech in the Pilot episode was epic, and it was disappointed how it didn’t turn out how we hoped it to be. Meanwhile, in season 7, one of our favorite moments was Alice’s speech, “You chose hate, but I choose love”, as well as Snow White and Charming’s entrance, and baby Hope. For all of Once Upon a Time’s fault, its music and the soundtrack will always go down as one of the things we loved about the show. Mark Isham did an amazing job piecing the show together through his scores. Killing Baelfire was the biggest mistake the show ever made. This isn’t about ships. If the writers chose to got the CaptainSwan route, then so be it. But killing Neal and then acting as if he didn’t exist and as if his loss wouldn’t complicate their world, their characters, and the interactions between characters was nonsense. Every time Rumple did something incredibly stupid or evil, Neal should have been there. Every time Emma and Regina needed to do something that involved Henry, Neal should have been there. We could have gotten Neal as the unifying factor between the original Hook and Rumple like Alice did with Nook and Rumple. The race to save adult Gideon would have been far more interesting with Neal trying to help his brother see their father in a better light. There was always a way to keep him alive and involved in the lives of everyone without having to ruin whatever shipping endgame the writers wanted to go with. Neal’s death was a cheap and easy way to get what the writers wanted romantically but without looking ahead even a little bit. The show’s general focus on family was, indeed, another favorite moment. The way they go through together with hope is admirable, which one of the first season’s episodes demonstrated perfectly; when Mary Margaret and Emma treated each other like family before they knew they were family in the episode Hat Trick. However, everything involving King Arthur and the Dark Swan saga, especially the twists in the mythology of the Dark One that were created was included in our least favorite moments, as well as the inclusion of Jafar, Aladdin and Jasmine over into the main show and completely underutilized them. Finally, we loved every time we go farther back in history. Getting to see Rumplestiltskin and how he became the Dark One, and then later it’s getting to see a Dark One before that, or getting to see Peter Pan rather how he came to be; getting to meet Merlin and how magic came to that realm, and going farther and farther back like that was so cool to see the timeline stretched, as well as to see more of that backstory. Not just character development, but how a certain plot even come to be. Even seeing the beginning of Storybrooke in the episode, “Welcome to Storybrooke“, and how it popped into existence is certainly a moment to remember. Thank you so much for your support. It’s been amazing, the financial support that we’ve received, and thank you to the hundreds of people who sent us feedback over the 7 years. We’ve received so many good theories and feedbacks, suggestions and encouragement, as well as constructive criticisms, podcast reviews in Apple podcast and Stitcher; Tweets and followers, positive responses and messages saying that we made them keep watching the show, or how the podcast helped them through a difficult time in their life. And for one final time, we say Thank You… Have a Happy Ever After… and Thanks for Listening. Farewell, Once Upon a Time.